PLANET in PERIL, your "one-stop shop" for the truth about our planetary crisis. : Want to save the bees? Dig up your lawn! Want to save the bees? Dig up your lawn! Plus some bee-utiful photography. STORY HERE. 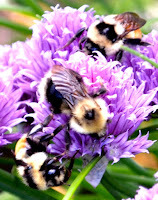 Pesticide increases probability of bumblebee extinction. Will New Research From Europe Nudge Canada Toward a "Neonic" Ban?